Ah, January. Aside from being the first of the year, there really isn’t much going on this month. I know NASCAR starts it’s season in a few weeks, February 14th. That is something to get excited about. Especially, since they have changed a few of their rules. Apparently, fan interest was way down, so, the ‘powers-that-be’ decided, one, that bump-drafting will be more tolerated, and, two, restrictor plates will not be limited, as they have been, at the super speedways. Basically, this amounts to some edge-of-your-seat racing excitement. Officials had imposed the limits for safety reasons, but, the rulings seemed to make little difference. There were limits placed on how much the drivers could bump and nudge each other. At Talladega and Daytona, because they are such large tracks, restrictor plates were initiated back in 1989. The restrictor plates were intended to cut down on horsepower, thus, speeds, in an effort to cut down on the number of bad wrecks. The drivers feel they should be capable of policing themselves. So, we are going back to some good old bang ’em up racing – hopefully! When ‘Winston Cup’ became NEXTEL Cup and racing came to be so commercialized, I all but stopped watching it. The races had become boring with all the restrictions, as well. It sounds like I was not alone. Now, maybe, the races will be exciting, once again. I started watching racing way back in the ’80’s, but, lost interest a few years ago – about the time Dale Earnhardt was killed. Maybe, I will give it another shot this season. Last year, when I bought my newest camera, I planned on taking shots of textures and patterns to be used in my art and scrapbooking. Now, I am trying to incorporate these images into my designs, not just the backgrounds. It is coming along, nicely, too. Though I don’t have anything ready to share as of yet, I did some experimenting and have some papers to give you. They aren’t anything spectacular. I have to learn to walk before I can run. LOL With these, I worked on technique. As I get more comfy with that, I will begin applying it to some designs. I thought perhaps someone might like them or be able to use them. Click on the preview, below, to go to MediaFire to download. 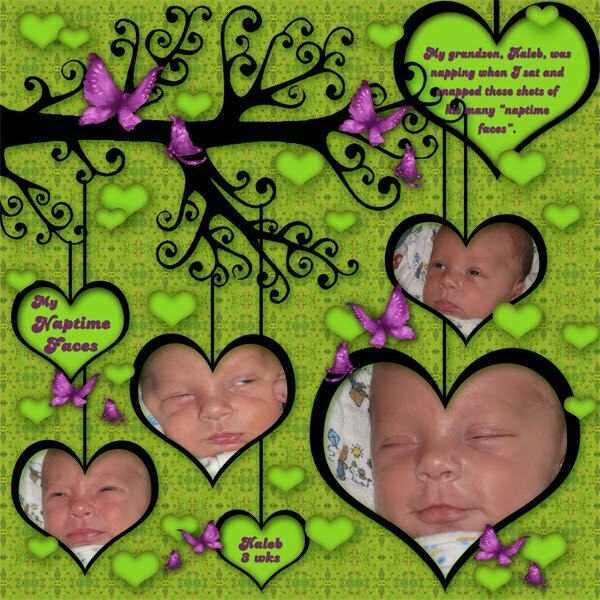 In my last post, I showed a layout that I had done of little Kaleb napping. I thought perhaps someone might be interested in the branch with hearts/frames. So, I have also placed that for you to download, as well. Here is the preview and, of course, click on it to go download. Here is the layout with Kaleb so you can kind of see what it looks like with photos. Here’s to hoping you all have a great week and weekend! Thank you for your interest and keep smiling! This entry was posted in CU, Photoshop. Bookmark the permalink. Thank you so much for this Freebie. I want to let you know that I posted a link to your blog in CBH Digital Scrapbooking Freebies, under the Page 3 post on Jan. 28, 2010. Thanks again. Thank you! Your blog post will be advertised on the CraftCrave DigiFree search engine today (look for timestamp: [28 Jan 02:00pm GMT]). Thank you for your freebies. I love that tree. The papers are nice too. Thanks again. I am bookmarking you so I can come back. Thank you so much for this post. I want to let you know that I posted a link to your blog in CBH Digital Scrapbooking Freebies, under the Page 3 post on Mar. 23, 2010. Thanks again.